If anybody in 2011 stated that Derrick Rose would one day join LeBron James on the Cleveland Cavaliers, people would find that idea insane. Before his big move to join the Miami Heat, LeBron had considered teaming up with Dwyane Wade to join Derrick Rose in Chicago in 2010. Nobody could have predicted how the future of the Bulls former MVP would turn out, clearly a downhill spiral since his ACL injury. Rose shocked the NBA when he signed a minimum 2.1 million dollar contract to team up with LeBron James in Cleveland. With Kyrie Irving requesting a trade and LeBron James commitment being questioned, why choose to play on the Cavs? The Los Angeles Lakers tried signing Rose, wanting the veteran guard to help the young talent bloom. The Lakers even offered more money in an attempt to steer him away from Cleveland, but Derrick had more than just money on his mind. Rose’s free-agency was disappointing and he knew the Lakers and Cavs had him in mind for a bench role. Derrick wasn’t looking to back-up Lonzo Ball on a developing Lakers team—he just wanted to win. Lakers made a strong push for Derrick Rose before he committed to the Cavs. Just couldn’t convince him of a bench role in LA. The clear choice for Rose to play in a winning environment was on the Cavaliers. Seeing his free-agency was a pretty dry market that left him minimum opportunities as a starter, Rose took advantage. Derrick would join James to compete on a team that’s been to the NBA Finals in the past 3 years. The Chicago native was initially signed as a backup to Kyrie Irving, but Irving’s trade request meant Rose could be a starter. After Irving was traded, sending an injured Isaiah Thomas to the Cavs, Rose will spend time starting. The Cavaliers guard has a chance to prove himself, before becoming the spark off the bench. 🌹 🌹 🌹🌹🌹 Let’s Rock G!! The New York Knicks are the prime example of what a dysfunctional organization and team look like. The idea to make the playoffs with the addition of Rose, or at least come somewhat close, fell flat. Rose couldn’t fix the Knicks problems throughout the season and received criticism for the disappointing season. Through the Knicks dramatic season, Derrick still managed to have his best season since his MVP year. His 17 PER, 47% FG, 53 TS% and 18 PPG while attempting 4 FT’s per game was his best since tearing his ACL. For Rose, unfortunately, he is looked at as a shell of his former self nowadays. It should come as no surprise why the 6’3 guard signed with the Cavs. If Rose can somehow average a similar stat line in a winning environment while staying healthy, his market would flip. While Thomas is out, Rose can attempt to fill the void left by Irving. Neither Rose or Irving shine as a defender or playmaker, so it gives Rose an opportunity to display his offense. 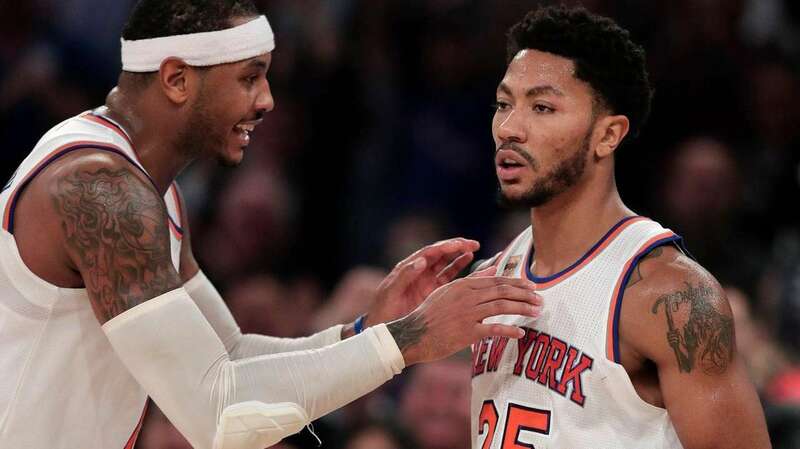 Now on the most talented roster the former Knick has ever had, Rose is paired with a great playmaker in James, Love and other exceptional shooters. Besides being a starter, Rose can provide a spark off the bench in the post-season. The Warriors have always had the advantage against the Cavs in the Finals due to their deep second-unit. The three-time All-Star coming off the Bench to lead the offense levels the battlefield a little more. Putting the NBA Finals on your resume is a huge bonus, especially when Rose excels against the NBA Champions. Derrick has put up 28.5 PPG on 52% FG the past two seasons against the Warriors. If Rose can somehow pull off an efficient offensive season on the Cavaliers while remaining healthy, teams will take a second look next offseason. Rose was not fortunate enough to accomplish his goal of leading his hometown team to the Finals. Now Derrick has the opportunity to become a champion, but even if he doesn’t, he’s benefiting his market value by his performance. If Rose disappoints we can expect to see him in a lesser role coming off the bench for another team. This is his best chance to prove he can still be a starter in this league and be in that winning environment he truly desires. A do-or-die situation for Derrick this season, and he is set-up for one of the greatest comeback stories of the NBA. This will be Rose’s chance to rebloom in an environment that’s focused on one thing—winning.